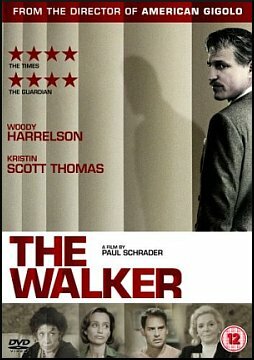 STARRING Woody Harrelson, Kristin Scott Thomas, Lauren Bacall, Ned Beatty, Moritz Bleibtreu, Willem Dafoe, Lily Tomlin. SYNOPSIS Carter Page the third is one of the many society walkers in Washington DC. His occupation is one many dream of ... to take the wives of some of the many rich and powerful men in the city to functions their husbands cannot be bothered to attend. But this life of ease is about to be turned unside down as Carter is dragged into a murder by one of the wives he escorts. He agrees to say he found the body in order to protect Lynn, the wife of a senator and her husband. Things do not go to plan though and an ambitious District Attorney is determined to implicate both Carter and Lynn in the murder. Carter soon discovers who his real friends are and needs to decide what really is important in his superficial life.